This was a productive weekend. I took apart the Memories of Smudge top, pressed the blocks again and made the extra blocks to add a sixth row. I’m going to be playing for a while with the layout, arranging the blocks so that the “S” appears. I started working on it last night but was getting too tired and left it with 3 spots left to fill in. I have 5 blocks left to play with. Whichever 2 blocks don’t make it into the top will become part of the quilt label. Looking at the picture I can see I need to move some of the blocks around to distribute the darker blocks a bit more evenly. 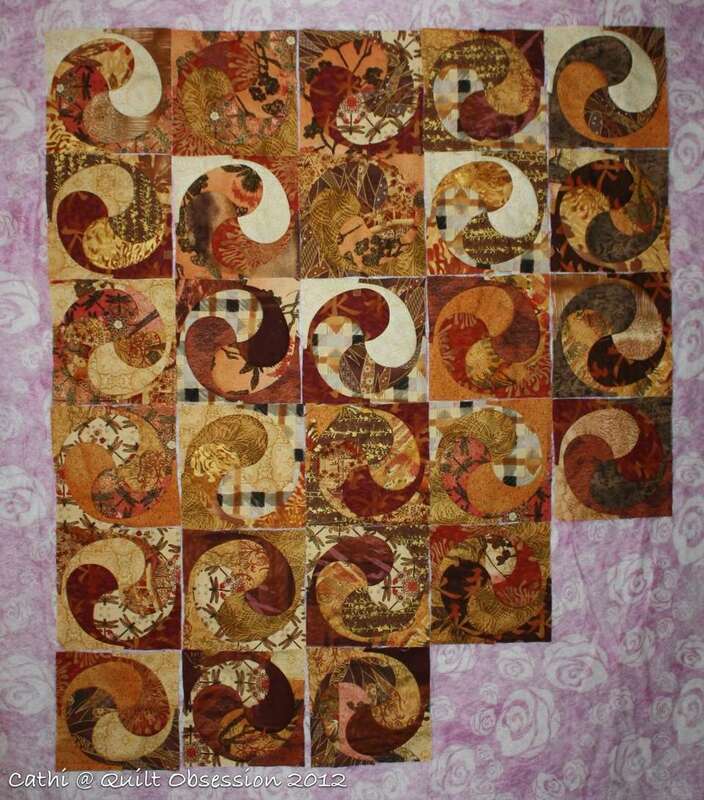 Before the Memories of Smudge blocks took over the design wall, I put the shabby chic Yin Yang blocks up just for fun. There are still 20+ of these blocks to make. I’m not sure how I’m going to arrange them yet, but may decide to do another “S” arrangement. 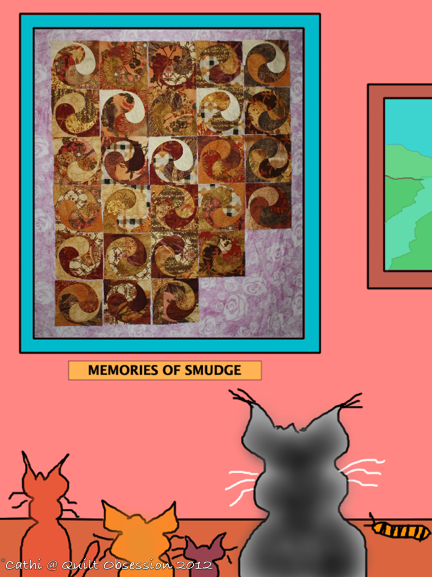 Baxter was showing some of his kitty friends the progress of Memories of Smudge on the design wall. He was a very busy kitty on the weekend, chasing leaves as they flew by the window and playing his new favourite game which involves us tossing one of his toy mice to him and him batting them right back at us. 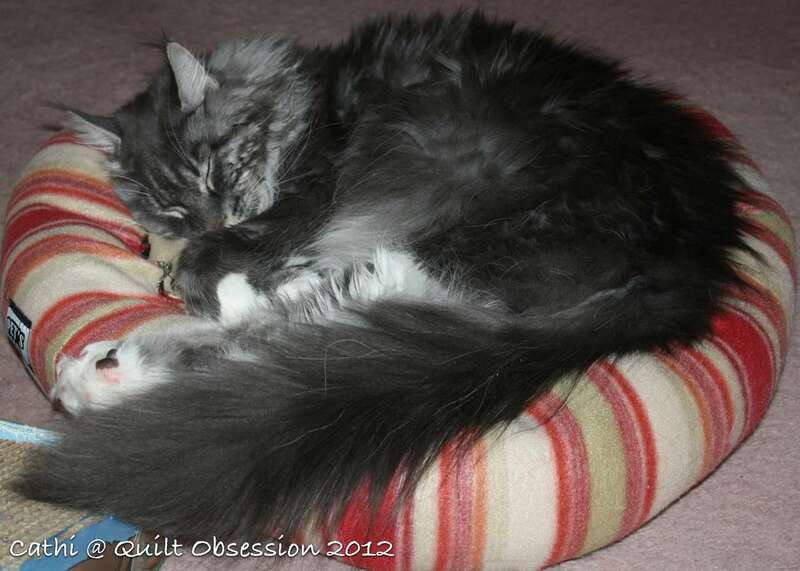 Sunday night he was crashed in one of his kitty beds. Looks great. Love seeing the Baxtertoon with the Design Wall share! How cool is that? Baxter’s design wall is really great, that’s clever! Poor Baxter, playing has tired him out. 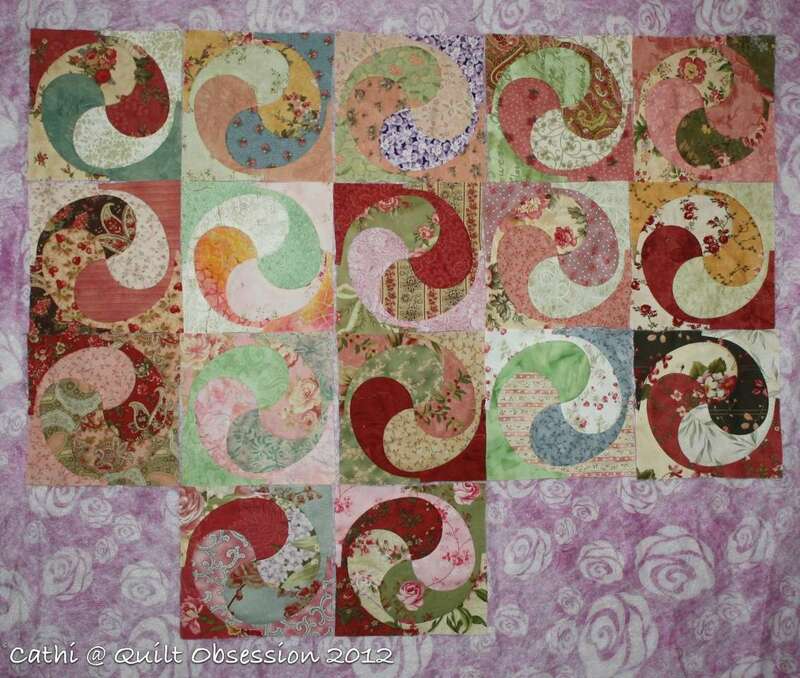 Nice to see the shabby chic Yin Yang blocks again too. Baxter is so cute curled up there.